Enchanted Village of Lights at the Lake of the Ozarks | Crystal Water Villas Blog - Lake of the Ozarks! Looking for a festive time at the Lake of the Ozarks this winter? You won’t want to miss the 20th Annual Enchanted Village of Lights at the fairgrounds in Laurie, Missouri! The Enchanted Village of Lights is an awe-inspiring, drive-thru display that will be sure to brighten your holiday. 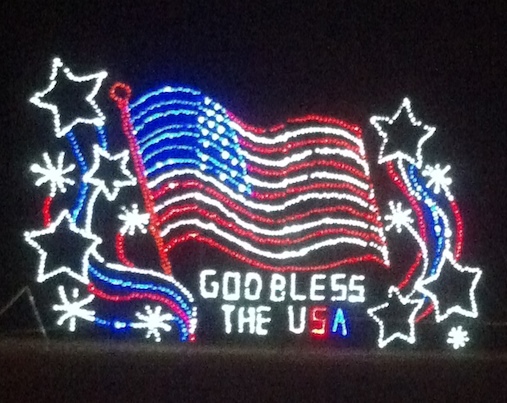 The above “God Bless the USA” light display is one of the newest to be added to the spectacular show of lights. The display kicks off on November 17th and goes through January 1, 2014. Book a stay with us between now and January 1st and we’ll make a $20 donation to the display in your name! Simply use the code “LIGHTS” when you book your stay!